As an industrial automation company, SIPI, besides creating automatic lines/systems, develops custom software for plant management integrating such, where required, with corporate management programs for the exchange of data. 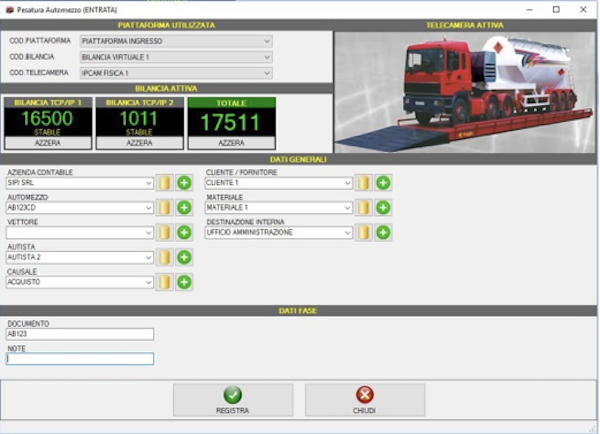 SIPI also offers a series of standard or custom software packages, created for the management of information, such as the piece-counting software, software for weighing lorries via a weighbridge, monitoring software for a multi-scales system, software for measurement of weight and volume and tools for the management of the weighing terminals. 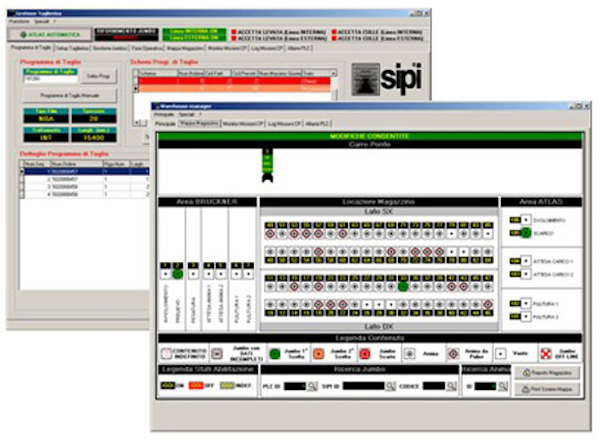 SIPI produces complete automation in conjunction with order fulfilment and shipping procedures, procedures ranging from inventory picking to the loading of pallets onto the vehicles of the carriers, which speeds up the delivery process while reducing the working time and the possibility of errors. Where necessary, SIPI also offers weighing instruments suitable for automatic calculation of the volume of packages or pallets during the weighing stage and with the relevant data management at the same time. SipiPap is software for the management of weighing operations of incoming and outgoing vehicles by means of a weighbridge platform. The software also handles the tags, both custom and temporary, for vehicle recognition and a video camera to view the operations with the ability to take shots of the vehicle. incoming/outgoing vehicles, to print a record card, to record the data and to have a history of operations performed. 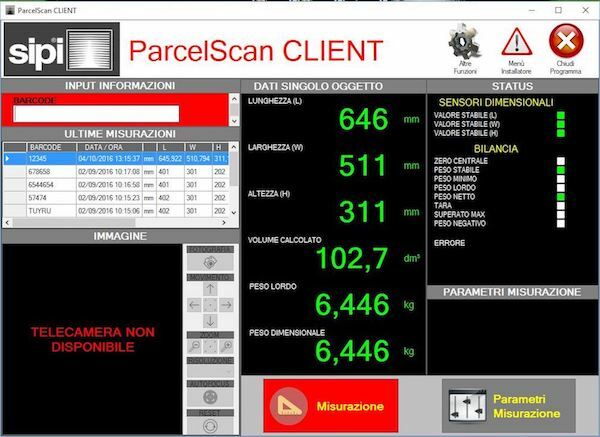 The SIPI ParceIscan Data Collection software connects to the SIPI weight and volume detection systems by means of which the operator can obtain with a single reading the weight and dimensions of packages of a regular geometry, also calculating their volume, and collecting the data in a central database and transmitting it to a management system. 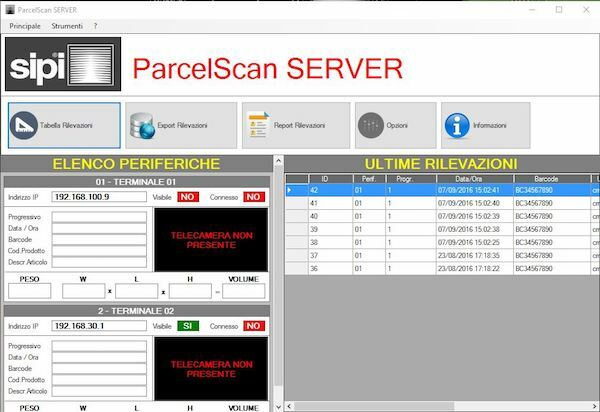 The software can be supplied both in client version in which the capture is controlled directly by the operator, or in the server version that can be connected to one or more Parcelscan systems in listening mode waiting to receive data. 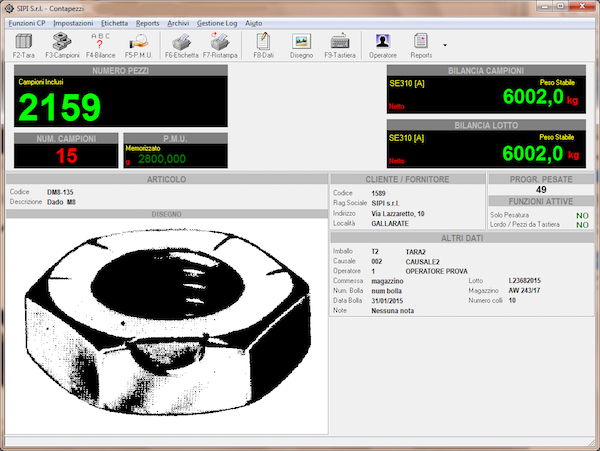 The SIPI CPWin piece-counting software is an application program that integrates with the SIPI SE series weighing instruments to count objects, from small to large components. It can be installed on a single workstation or be networked to a server to manage multiple workstations. The software uses a database (SQL/Oracle) or can connect to the customer’s AS400 for Articles, Customers, Reasons, Causes, Tares and Operators archive management, for which data in txt or csv file format can also be imported. Weighings are stored in a historic archive to ensure trackability of operations performed with the ability to export data in txt or csv file format. It is also possible to create custom labels with logos, images and barcodes and print them using a thermal transfer printer, or print reports using a network printer. 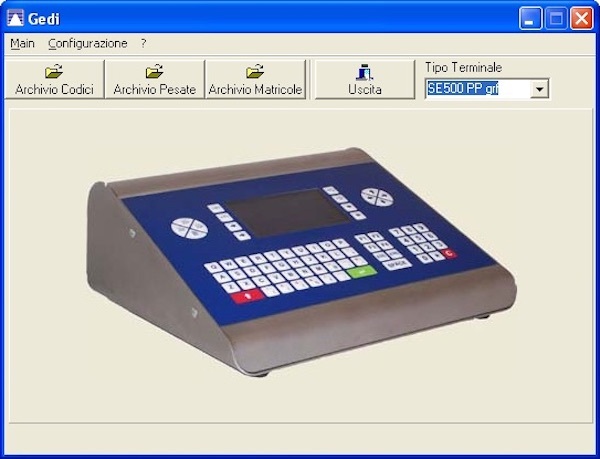 Weighing and/or monitoring software can be connected to one or more systems, to control or monitor the weighing operations. It can be supplied in client and server versions. In the first case it is the operator who controls the weighing and data capture stage, while in the second case the system is in listening mode waiting to receive the data. The data is collected in a database to provide a history of operations with the possibility of producing reports. The program can be customised as required. 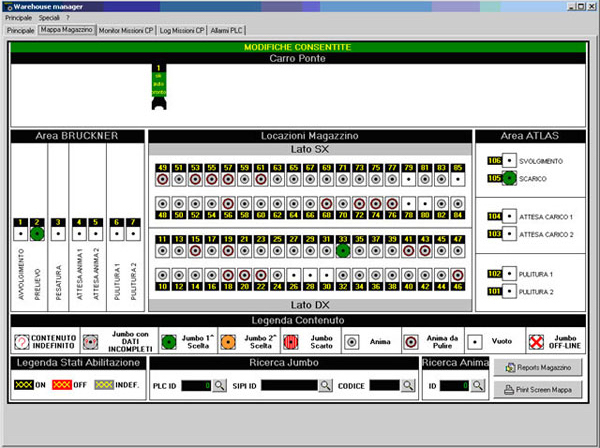 The software can be parameterised and is configurable according to the display terminal used. It allows the management of the base databases (4 archives that can be selected and parametrised directly from a PC, such as customers, materials, destinations, causes archives), with the possibility of importing and exporting to and from a terminal or PC. It also handles the export of weighings and the subsequent opportunity to print a report. 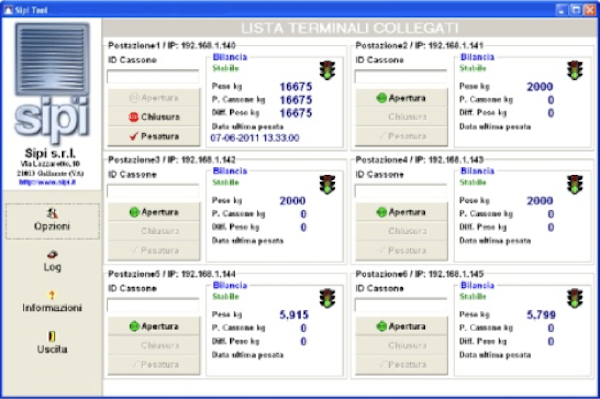 The weighings can be exported to a text file for subsequent submission to higher management systems.